By Alexis Leon, McGraw-Hill Education India Pvt. Ltd., 2014. 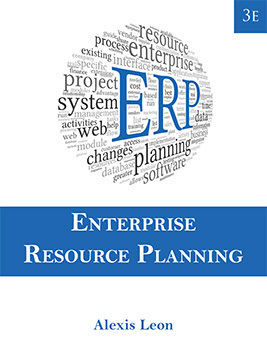 ERP or Enterprise Resource Planning is an integrated enterprise-wide information system that integrates the information system and automates most of the business functions of the organization. The basic goal of the ERP system is to provide one central repository for all data that is shared by all the various ERP facets in order to smoothen the flow of information across the organization. This updated, revised, and enlarged Third Edition covers the latest developments in the field of ERP and information technology, including the popularity of the Internet and World Wide Web, emergence of new technologies, and changes in the market dynamics. The discussions are supported by ample case studies and resources, alongside a bibliography and a glossary. Today having an ERP system is not a luxury, but a necessity. Having a properly implemented ERP system and a fully trained workforce that knows how to use the system in the best possible way is a must for survival in this brutally competitive world.This book is primarily designed for students and contains a host of pedagogical features to make learning more effective.